Thanks for all the kind words except that kitty ... be sure Junior will snip off your tail when he is fully healed ! 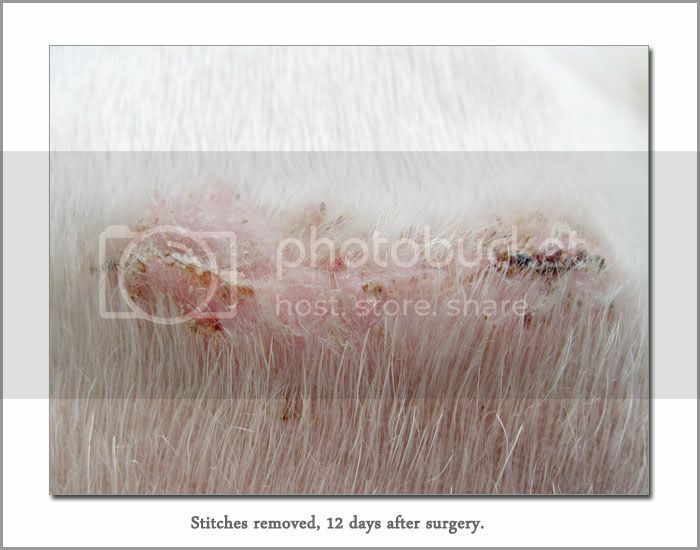 Stitches removed. Scar is dry and flaky but it's healing very well. End of chapter one for now. Junior begins his next step towards a full recovery next week. Will be going through two rounds of cartrophen injection for his other leg. And if all is good ... it's time for his yearly vaccination too. But for now ... I can relax and enjoy the weekend with one less worry. Time to hit the boat for some offshore fishing ? I hope they are right when they say dog's saliva can heal wounds ! Now it's looking very "clean" ! patrick2405 wrote: hahas that scars are a sign of manhood? It's something to be proud of, and dBs says Junior 'showing off' the scar didn't she? He is using a lot more of his leg. Though he still limps when he is running but the leg is in motion with the other leg. No more holding the leg up like before. He can even jumped up the sofa already. His hip muscles growing very well, making his bum look round. 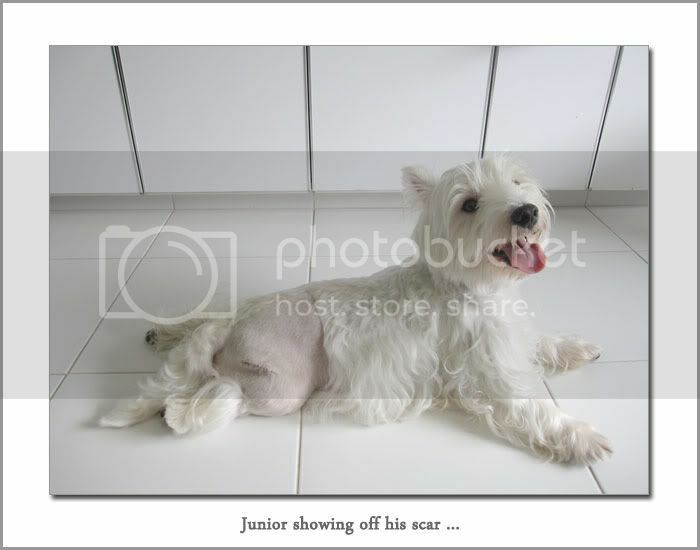 Junior's used to have a very small hip due to the deformity at the hip joint. Vet is very happy with his progress. Next review will be in a month's time and an X-ray will be needed then. what a darling he is . . . Junior went for a review on Friday. An X-ray was taken and the result was positive. His joint has recovered and it is not causing him any more pain. He still hop a step or two at times, likely due to weak muscles joint. It will take some time before he completely heals and gain full control of his right limp. 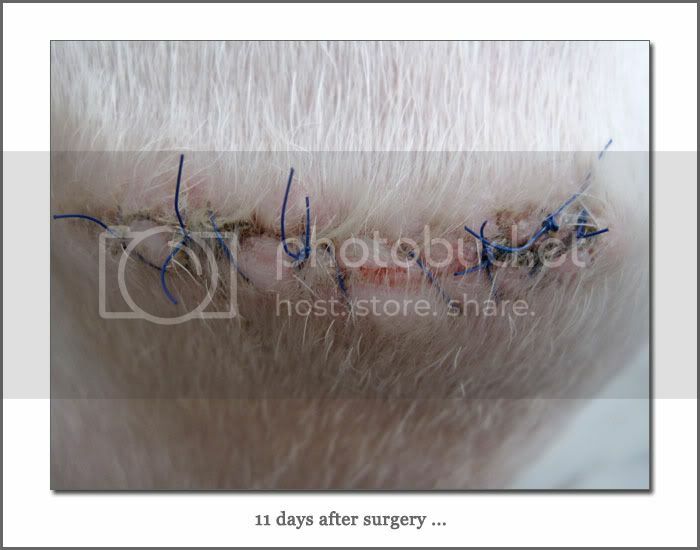 He still has a grade 1 luxated petella on his operated knee and a grade 2 on his other knee. Dr Kim examined him on that and it is not causing him any pain or discomfort. He had another cartrophen injection. 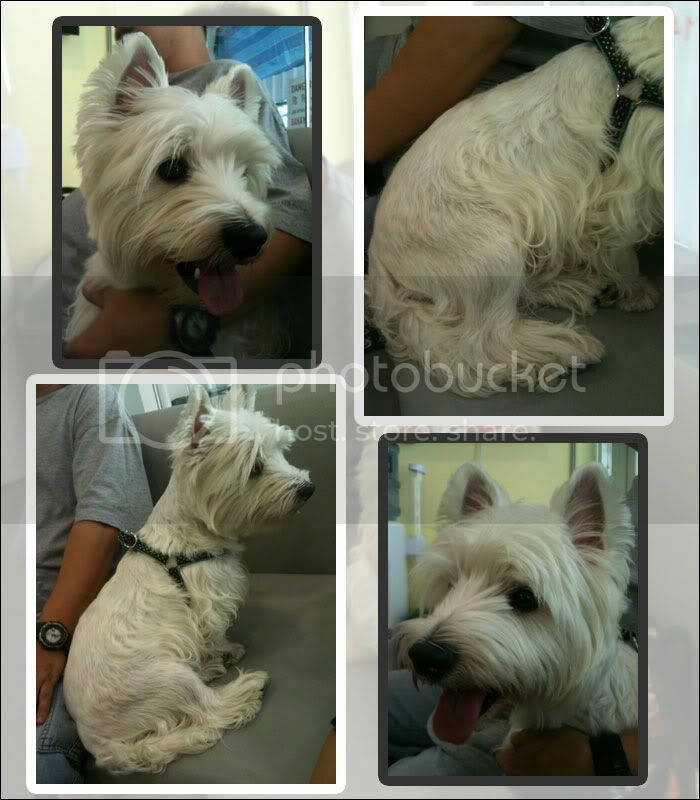 Will be giving him daily dosage of glucosamine as supplement. it will be good if he can be a little lighter. Junior is enjoying his new limp ... running freely like any other dog. If not for the occasional hop ... one would hardly notice he had gone through a surgery just two months ago. 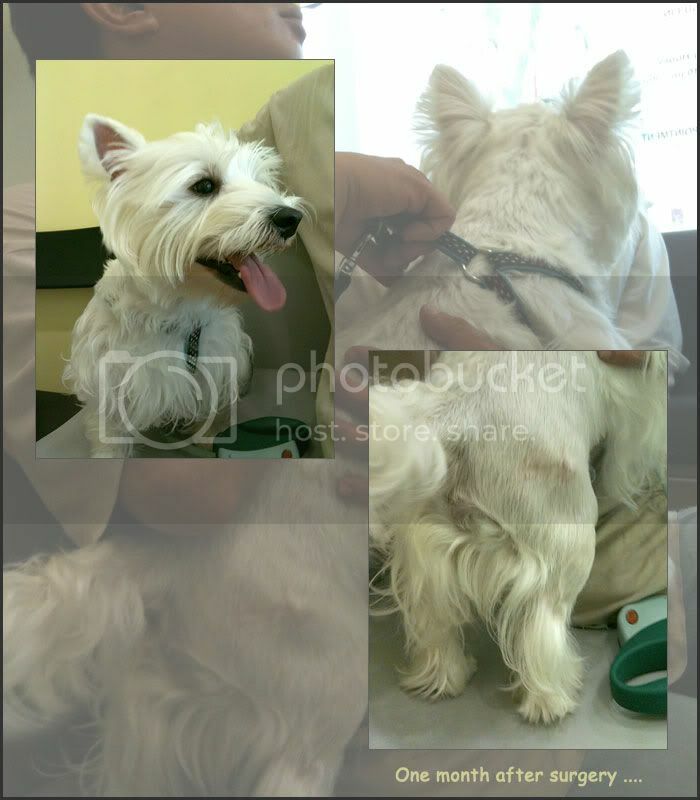 He will good and need no further reviews till his yearly check-ups and heart worm injection in 2012. Thank you everyone for the concern regarding Junior's condition. Junior says "Thank you everyone ... woof woof !"